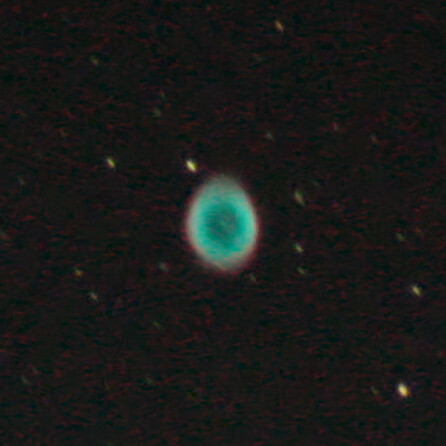 The Ring Nebula (also known as the Planetary Nebula M57, Messier 57, M57 or NGC 6720) is a prototypical planetary nebula in the constellation of Lyra. This is one of the most famous nebulae often used as an example of this type of astronomical objects. It is located at 0.7 kpc (2300 light years) from Earth and was discovered by Antoine Darquier de Pellepoix in 1779. Their joint magnitude V-band (green filter) is equal to 8.80. Its real form is possibly a bipolar nebula seen with an inclination of 30 ° from its axis, and calculated that it has been expanding around 1600 years. From their radial velocity, -19.2 km/s, it follows that approaches Earth more than 69120 km/h: this rate is caused by the combination of the sun’s orbital speed around the nucleus of the Milky Way and the speed of the Earth itself. M57 is illuminated by a white dwarf at its center of visual magnitude 15.8. This picture is a single shot of 30 seconds exposition through a SkyWatcher 6 inches refractor telescope at prime focus. Fitsworks4 was used to remove a bit the background noise.